NAHANNI!!! ” Where few men go…. with shores of Death! Albert Faille you are my hero, I have this disease, an S.T.D. if you will, that drives me to do things a certain way usually the hard way and to repeat that same process in the way I learned it until beaten into submission by the task. Then taking the easy or easier way to complete it in the worst situation. It’s Labor Day weekend, and whats that all about? to some its a much needed three day weekend from time spent somewhere they don’t want to be doing something they don’t want to do but doing it anyway, I respect that.To some its to celebrate that they have a job they like. And some its just a moment to reflect on having a job, knowing life is too short to take the B.S of the grind to seri0usly. Albert’s job in life was clear to him- find that gold and survive in doing so. You can look at the perils this 78 year old man put to himself and think all that for gold? AND at 78!?! Well I think in life its good to have an end all goal but all the portages and climbs up the hills and the threat of capsizing at any moment are really whats important, this is where you learn and grow and become much more of a resource to yourself and others. Fall is a distant memory that is being reintroduced here in the North County, it’s a ways off but there are some signs that we have made it through the worst of this summer. I think August is my new favorite month, the days heat relents a bit but it still feels like summer, the water is warm and the fishing great and some of the trees start there long slow transformation of loosing leaves that, with some of the vegetables and flowers coming out of the garden, make me think of fall. If your garden floweth over like so many do this time of year check out Louise Langsner’s blog for some delicious ways to use those fruits of our labor. Soups are great fun you can eat them hot or cold. And while your surfing Peter has some books, some spoons and some tools- some that I have used -to check out on his page. Jenni took great care of these tools they are workers not shelf tools and all have been tuned to bring out the best in them. 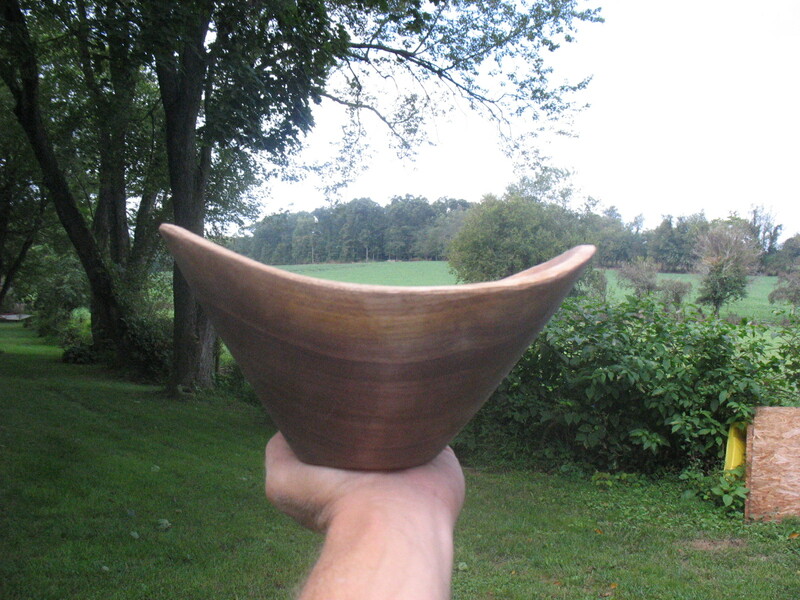 I’ve been kinda stuck on this shape of bowl, I don’t know why but when I start a bowl lately it end’s up like this………… it pleases me. 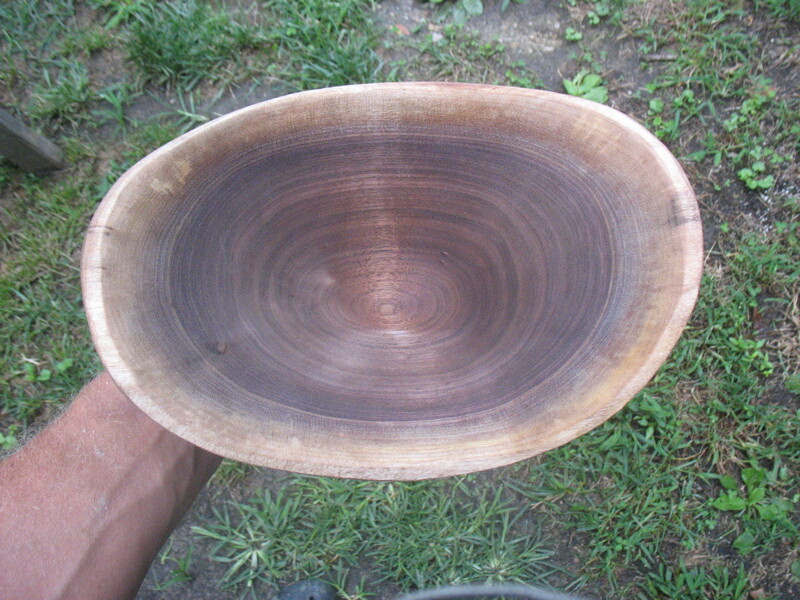 This one is Walnut, some may say you shouldn’t use walnut for wooden wear because of the tannin, I think if you ate the bowl you’d have some issues but to eat salad, bread or snacks out of it is perfectly safe. 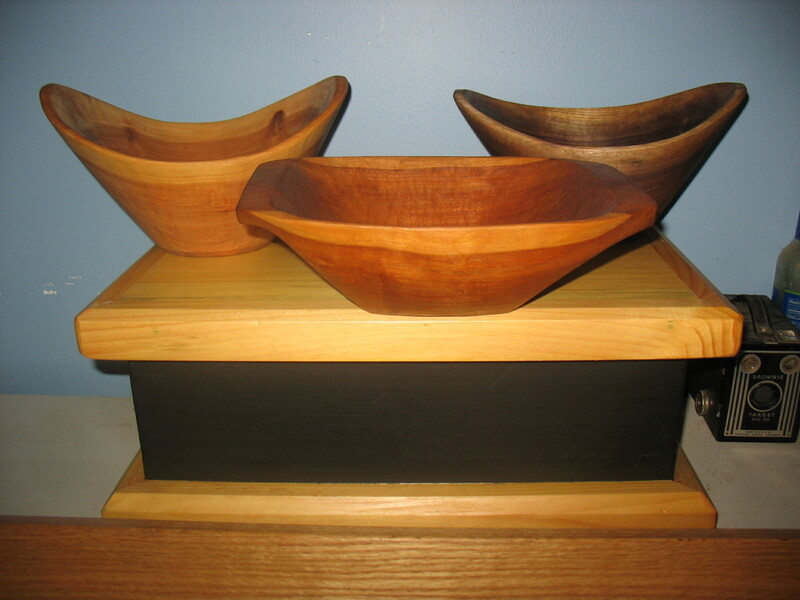 These make great gifts, I have given and sold many as wedding gifts, this seems to be wedding season. I have three for sale 90$ each plus whatever shipping email me if your interested sunwoodworking@gmail.com .Two are Cherry and one is Walnut, they are made from a green piece of wood with an axe, adze, gouges and spoke shave. Not turned on a lath. A little more on that here. I’ve been swamped the last few months, and summer is always a huge distraction for me. 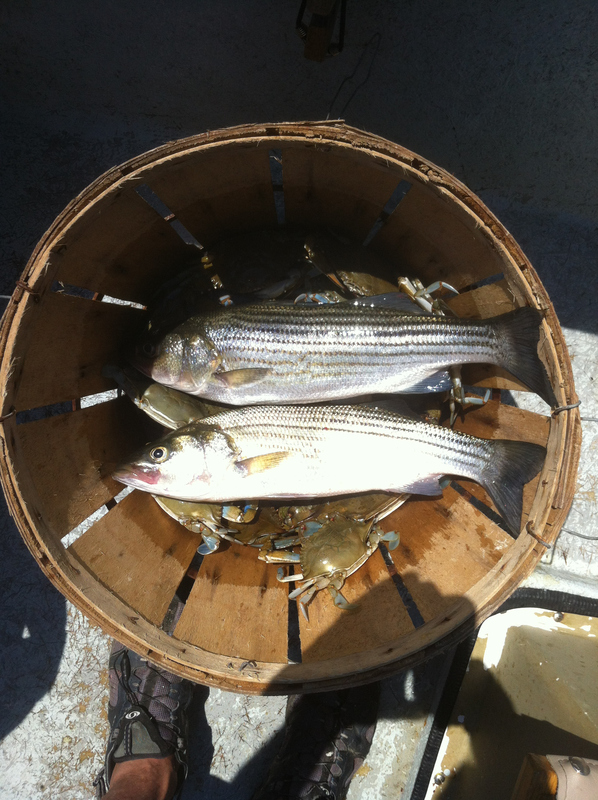 Too many fun things to do involving water like canoeing with my daughter on the Gun Powder, fishing with friends in the bay or a boat ride with the family are much more inviting than spending every weekend in the shop. 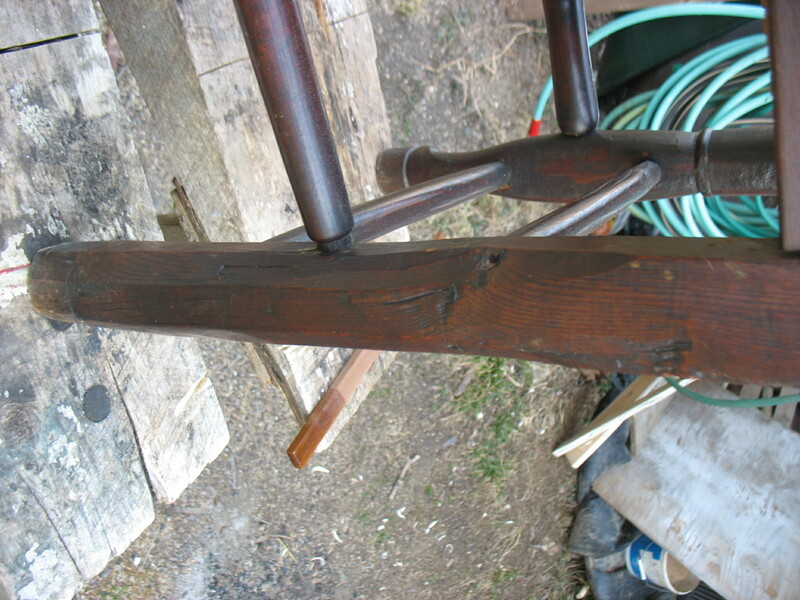 But I have thought about you all and have wanted to give an update on the English ladder backs I posted about before. It’s been a thrill walking back in time working on these and watching the London Olympics too, the areal shots of the country side are neet to see. It’s fun to have all of this happen at the same time. 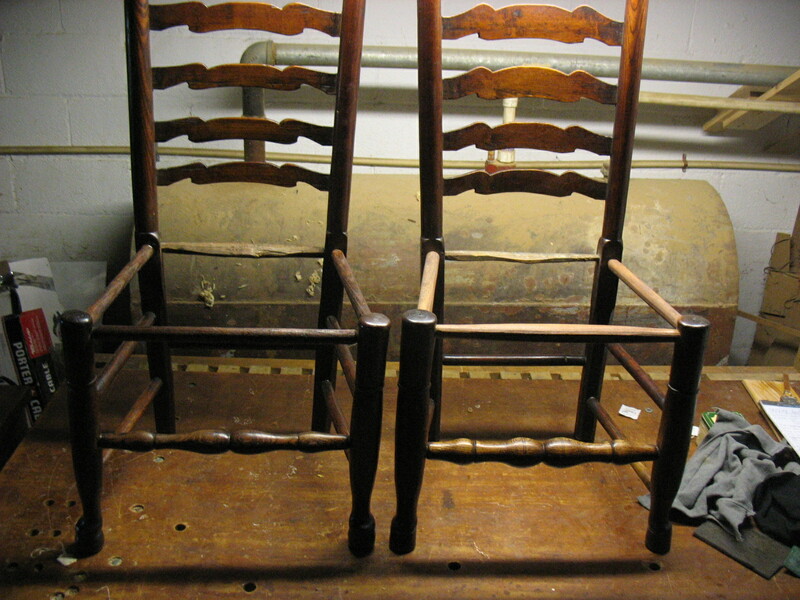 The owners of this set of chairs did get them appraised by Michael Flanigan of Antiques Road Show. He thought they were mid to late 1800’s with one or two of the set of eight being early twentieth century. I still feel the first couple I worked on were older than that. The techniques were old school no less, hey I can dream cant I? Mr. Flanigan put a value of 6 to 8,000$ for the set.The chairs have been in the family for a generation or so I believe and they like them. One could spend more than that on a new set of dinning room chairs. 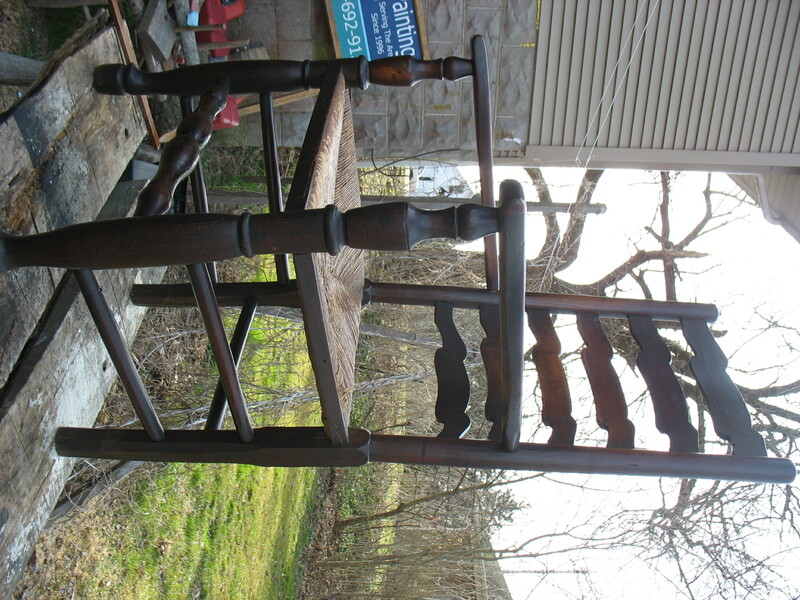 I think the general consensus ended up being “if you like them get them fixed and use them”, also they are not that unusual of a find.These chairs were made in huge numbers by many different craftsman through out the country. It is however a bit unusual to have a set this big with so many varying in age, said Mr. Flanigan . 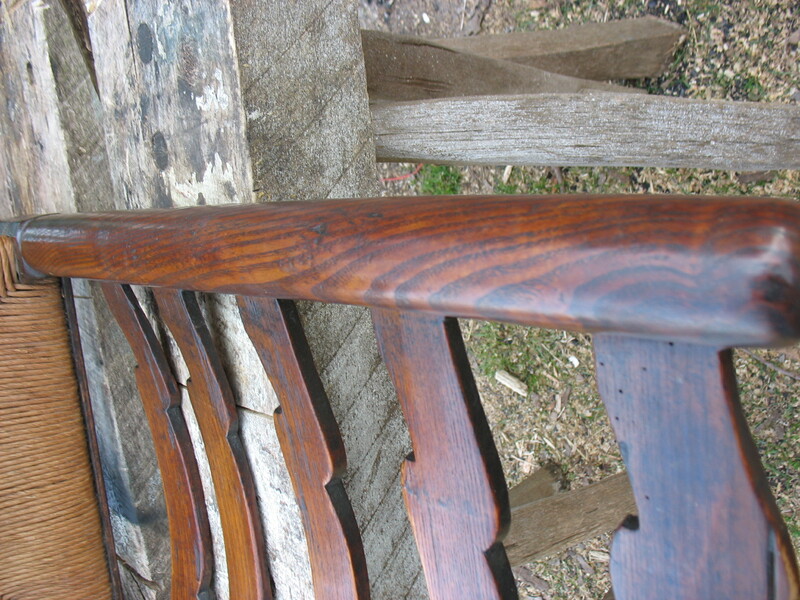 The pic above, it’s hard to tell but the mortises on this chair were drilled with a spoon bit. 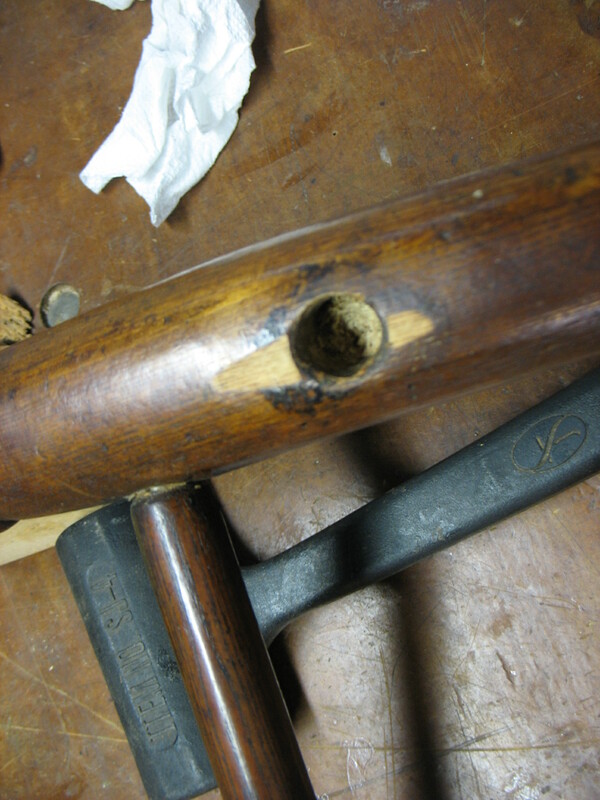 I say that because the bottom of the mortise is cupped not flat with no center hole or divet like you see with a modern drill bit. In all the years I have been doing this I still have not used a spoon bit. Alexander used to speak enthusiastically about these bits. There fast, precise and clean cutting. They can be turned at any angle with total control of direction and the ability to change that direction at will, something that happens when drilling by hand and eye, you need to make small corrections to hold the desired angle. 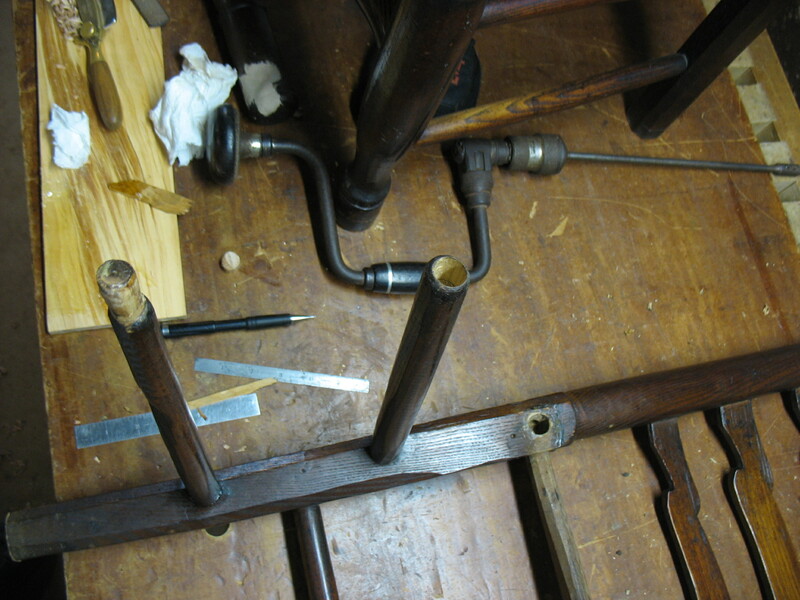 I like drilling with a brace n bit using a square and bevel gauge to see the angles I need to hold, (or no guides at all when its something I’m throwing together)its a fun challenge, probably because chair making by hand and eye is pretty forgiving. Now I want to get a spoon bit again……. As fate would have it I recently milled an American Elm tree! (I have some slabs for sale contact me if your interested sunwoodworking@gmail.com) so was able to replace the bad front rungs with the appropriate wood not that you’ll ever see them once the seats are on. 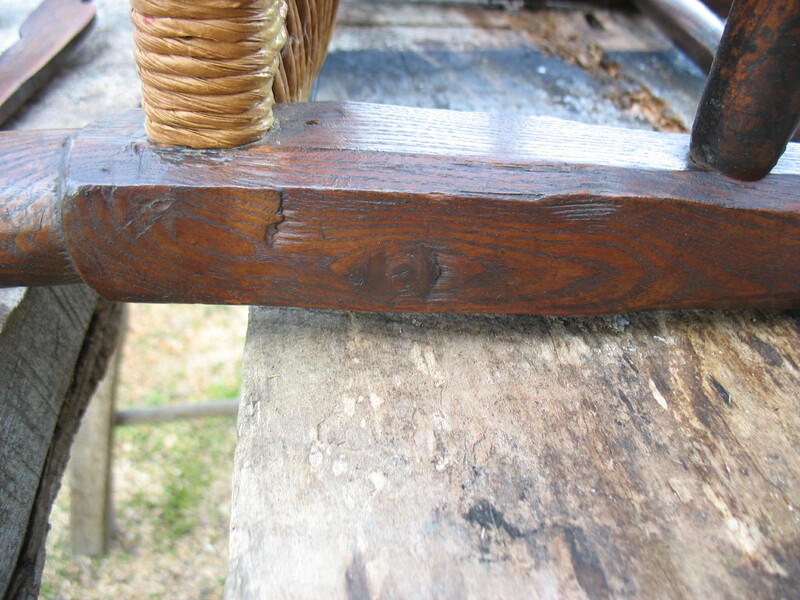 On one of the original seat rungs they used a piece that had the sap wood and the worm canals you see under bark of a tree that’s been down awhile. 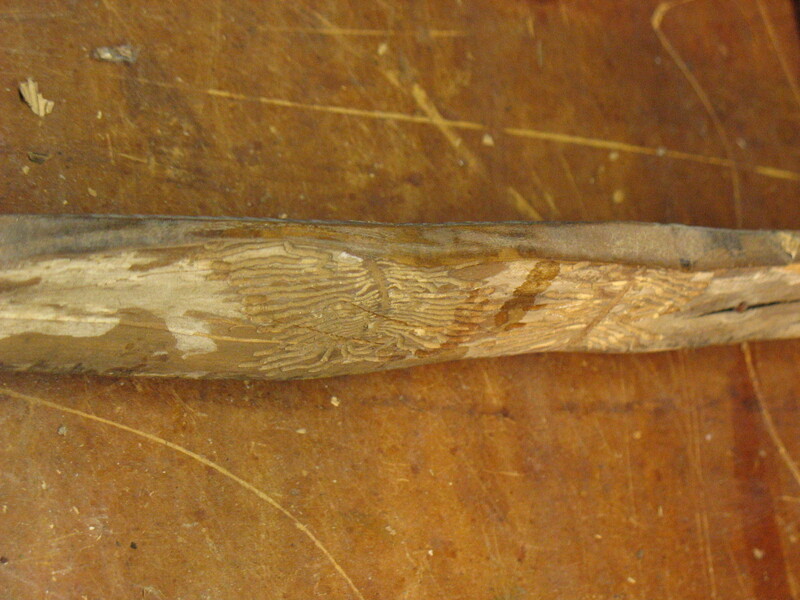 If I’m not mistaken Elm like Ash and many fruit woods can be used right up to and including the sap wood. In Red Oak for instance you want to split that off. There are other things that interest me about these chairs but not enough room or energy to include them all in this post, that this stuff can be a real snooze-fest if your not into it. 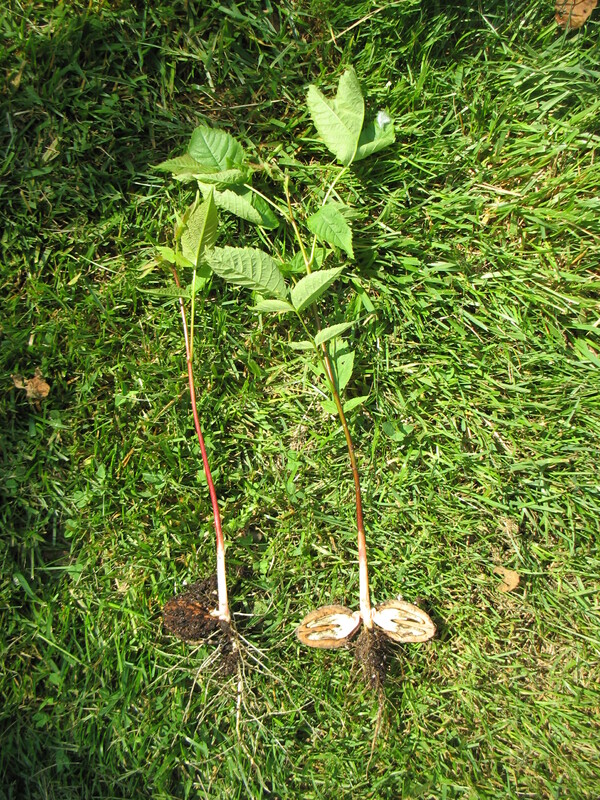 We have Butternut trees in our yard.The squirrls must have hid a few nuts in the strawberry box over the winter, these shoots were coming up. They must have had enough of food to make it through, these nuts went to seed.When pulled up one split open and revealed the ancient secret of how its done or at least what it looks like doing what it does. I still don’t understand what it is doing or what it’s done but it is enlightening to see it happening. I really like these trees there aren’t many around any more and I very rarely see the wood used in furniture making. They have become very susceptible to a growth that didn’t seem to exist decades ago.I’m sure the housing/developing growth is to blame as well. So as spring has sprung so has another round of great festivals and markets. BUY LOCALLY and Support your Neighborhood! where ever that may be. This Saturday 6-2-12 is the best of our local shows, the Gunpowder River Artfest at Boordy Vineyards, it’s an art show not a craft show. A lot of the stuff surpasses craft’s like Lori’s work and so many more. Help the local economy and your self and check this event out, buy something from an artist you’ll be happy you did. This weekend May 4th 5th and 6th I will be at the Timonium Fairgrounds with the Fine Furnishings Show.Here is a link to the Facebook page that has lots of pics and details of the craftsmen and woman. If you like furniture but don’t get to see what people are making these days as much as you’d like then you gotta come check this out. Lots of incredible local and regional artisans. 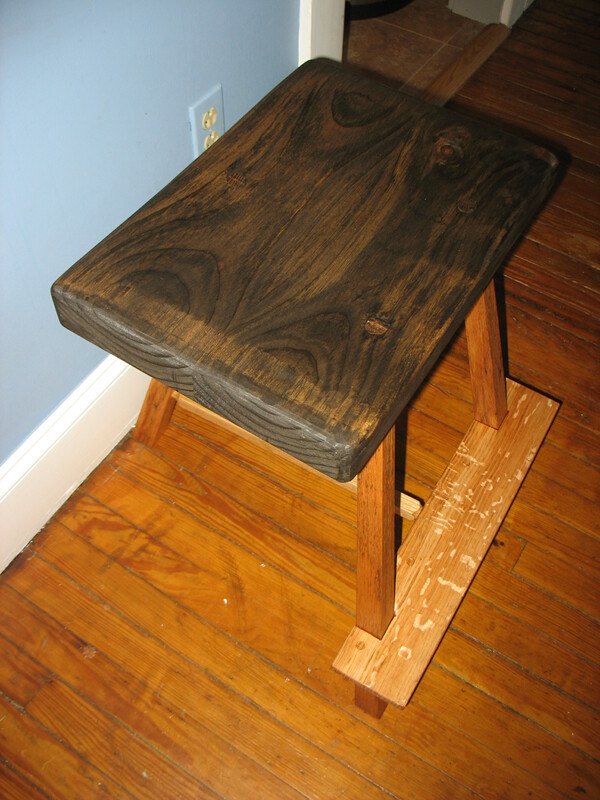 I am putting up this three legged counter stool as a door prize . I know I would be pretty excited to walk out with any of these door prizes. I think there will be wine there too, at least that was the plan a couple months ago when I met with the Karla Little the shows creator and visionary mind that brings this show to us here in the Baltimore D.C area. If that’s not enough reason to stop by and check it out/buy that piece you’ve been looking for to fill a space or replace, it runs for three days surely you can pop in, the flyer at the top of this page is good for half off admission, that’s $5$ bucks to you. Save it to your computer then print it out or on your phone click on it so it opens in a new window and show it to them at the door. I was asked to replace some broken rungs and tighten up a set of these chairs, eight all together, two arm chairs and six side. When I went to look at the chairs they told me a great aunt in Long Island gave them the set along with a dinning table that she brought back with her from a trip to England.The chairs looked familiar and while going over them it was obvious they were old and original. By old I mean like 1700’s and by original I mean the first of that design style. This style is still in production today. I knew I’d seen it before and started rummaging through my books and there it was first in Drew’s book “The Chair Makers Workshop” in the “Historic Chars from Britain” section. 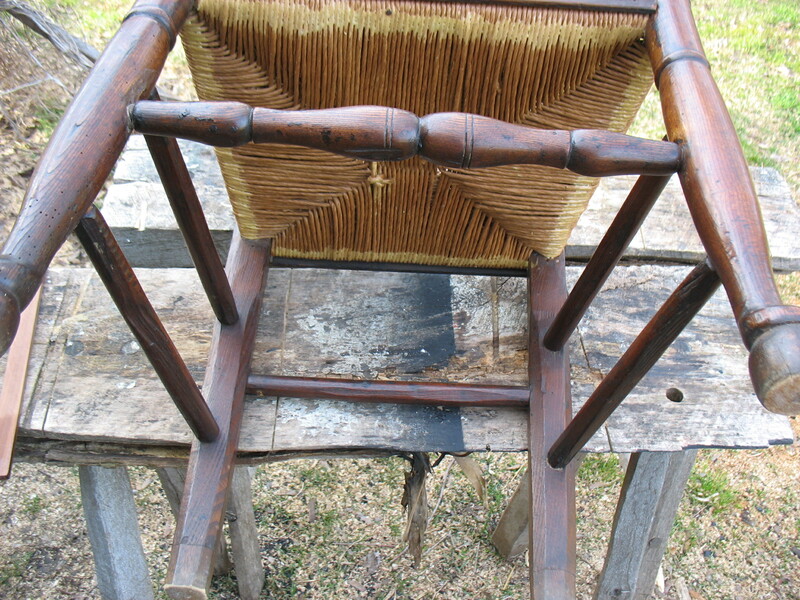 He got the picture from Bernard Cotton’s book “The English Regional Chair.” Cotton dates it c 1780. 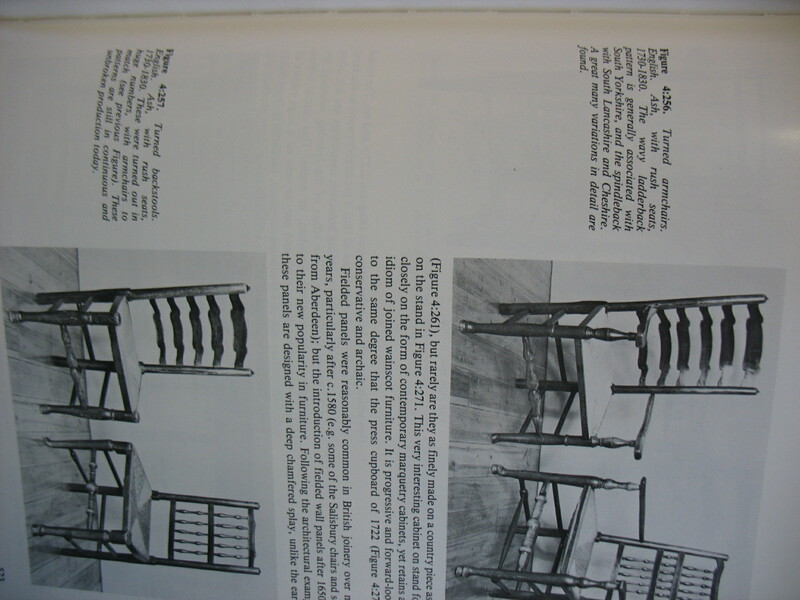 So with the info the client gave me and seeing the chair in the Britt section of Drew’s book it was obvious to look in Chinnery’s book ( and its the only book on Brittish furniture I have). There it was! Taken from Victor Chinnery's book "Oak Furniture the British Tradition"
These chairs have such a presence, their parts are very stout, the post are about two inches thick and the proportions are big compared to modern chairs. I can see a woman in all the dress they wore or a man with a big coat sitting. Homes weren’t as warm in the winter in the 1700′ as they are these days. I like the construction, some parts were sawn probably in a pit and some were rived from the log. All being green,that’s the neat thing about this construction wet post’s assembled with dried rungs and slats.Parts were made with a draw knife and shaving horse, some sections turned using a pole lath, and other parts made with a hand plane at the bench. tear out on rung from when it was split out or rived from the log. 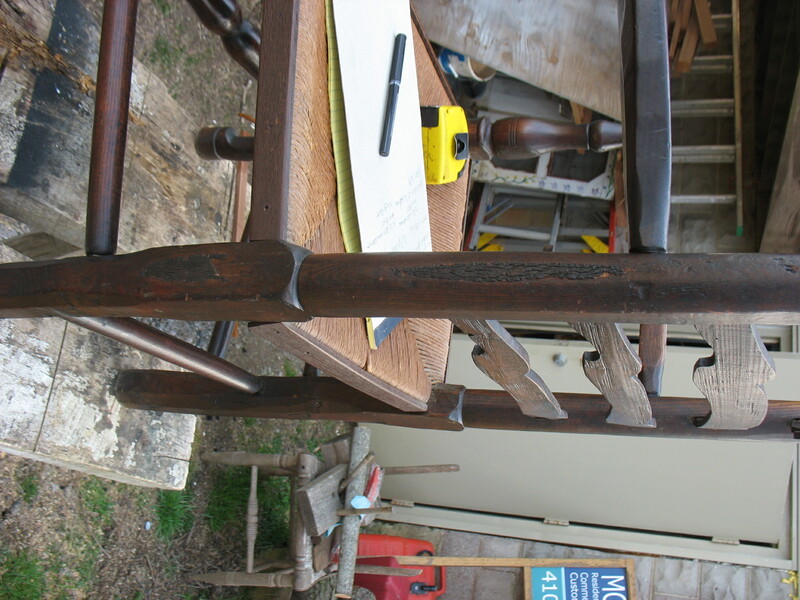 out so there were times I’ve tried to use a bolt that has a twist or knots, its not good fun and much work, the wood in these chairs is worse than anything Ive used, lots of knots and twist or wayne. At first look I thought it was Ash wood and the research said they were made from Oak, Ash and Elm. I now think they are Elm, if it is Ash then man that’s one scuzzy tree, but Elm can be a twisty knotty mess more often than Ash or Oak and its strength and availability made up for workability in those days.That’s just my thinking. We don’t have too many Elm here in the north county due to a blight so I’m no elm expert. There was one where I used to live it was big and old. 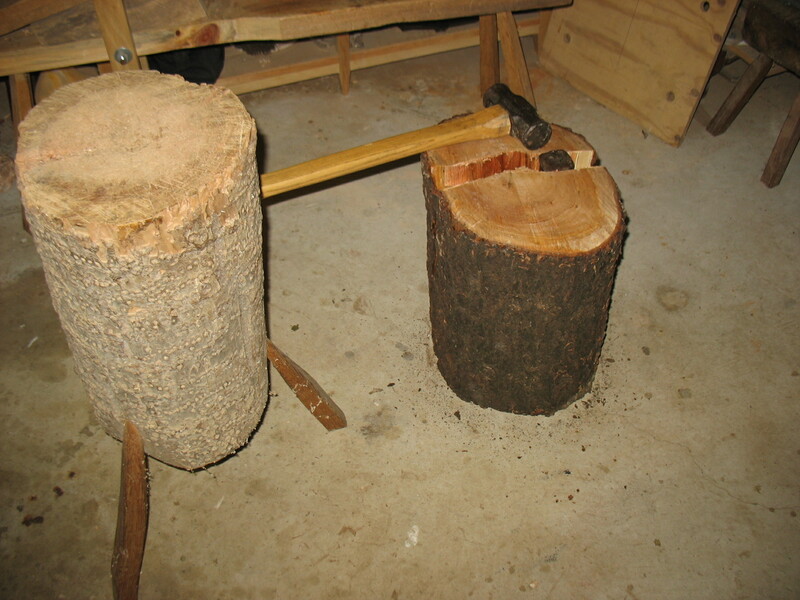 When some branches were trimmed I grabbed a couple firewood size pieces.The hold down on my shaving horse is made from that picking, strong stuff with lots of silica in the wood that feels gritty and dulls edges quickly. They put the tear out on the bottom of the rung so you don’t see it, unnoticeable until you look under the chair. Now days a piece like that would be discarded. 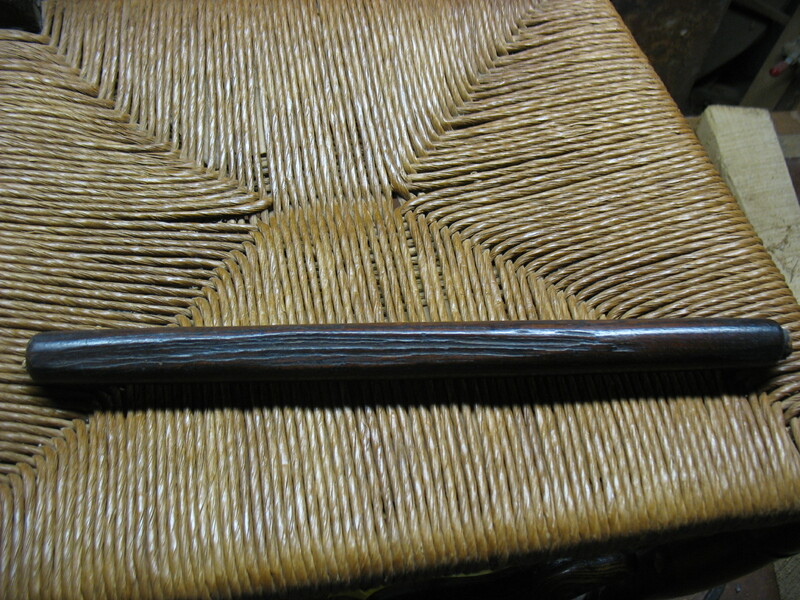 The back post are turned above the seat and square below with a chamfer on all four edges that looks like draw knife work. 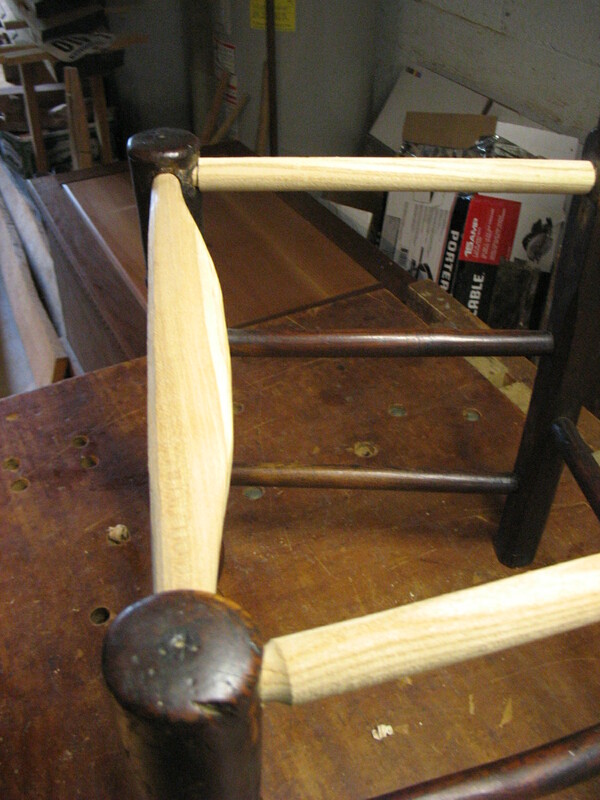 The seat rungs are tangent to each other locking them together inside the post. The grain in this back post could not have been split it must have been sawed out. Not much fun here,just hand planing the saw marks off there is resistance and tear out. I really want to date theses guys to the 1730’s, don’t know why just a feeling. 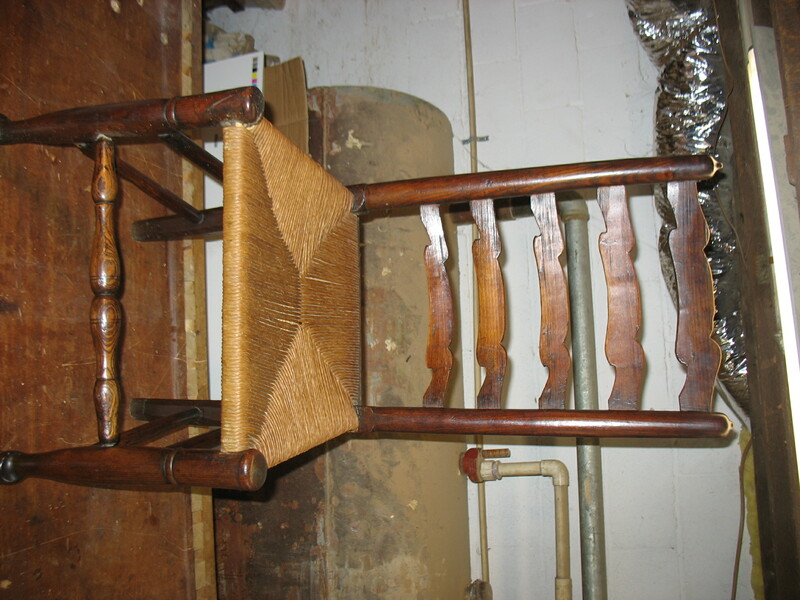 Bet these chairs were a mass produced item that was quickly assembled with the emphasis on proper joinery and speed. We cant be there when they were made but we can speculate, not as much fun as knowing with out a doubt but keeps you digging for more. I told the owners what I discovered and suggested getting them appraised before I mess with them. They are in that process now I’ll post what come of it when I find out.I’m thankful I got to see these chairs. 200+ year old Bark on the sides of the back post. The current owners didn't notice. That would never fly in today's standards. Apparently it’s in the blood. Mom gave me this pic the other day, the man standing in front of the steam engine (tractor) and facing it is her moms father William Burk 1857-1926, the date of this picture is unknown. 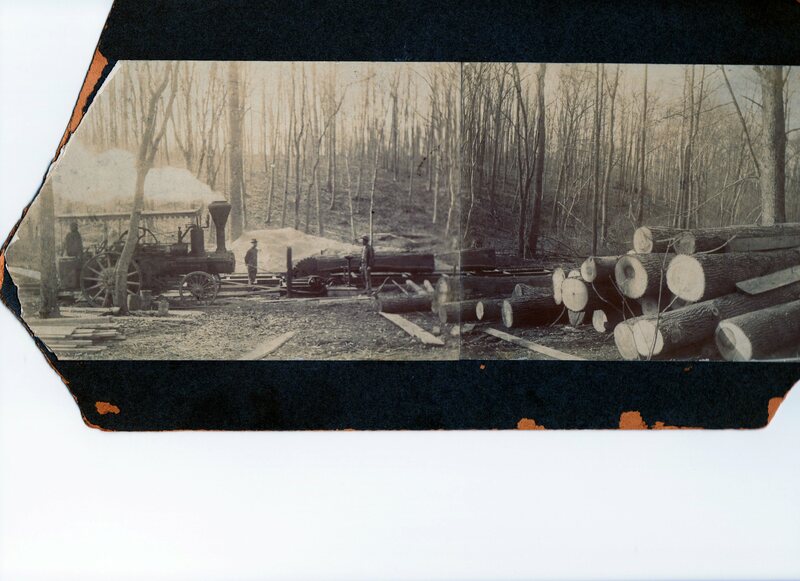 His mill was on Blenheim road just north of Loch Raven reservoir and south of Jacksonville Maryland. 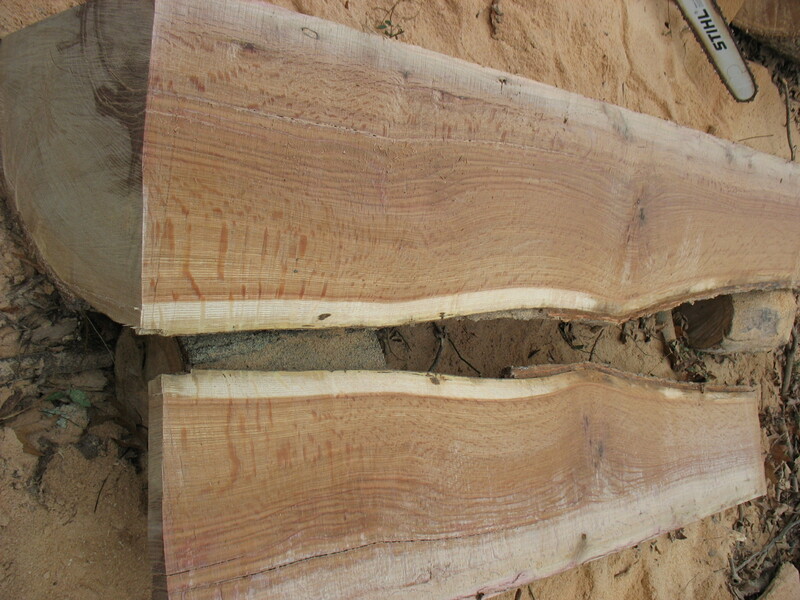 I milled some really nice cherry last weekend, crotch section with nice figure, it’s not uncommon to have a split where the limb joins the trunk but this one is tight. I milled it with the Logosol timber jig attached to the chain saw. 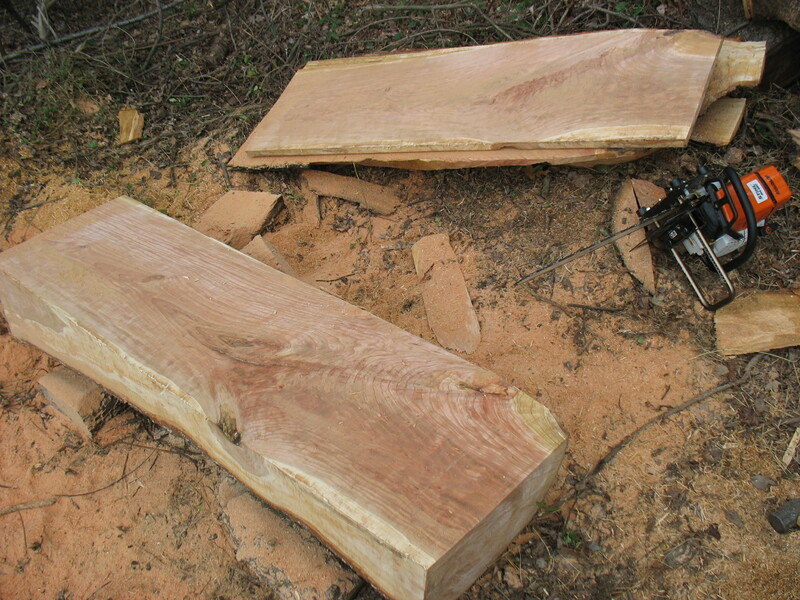 One appealing aspect of the chain saw mill is you take it to the tree, this cherry was at a friends house on the edge of his yard going into the woods, he didn’t want his yard torn up so this worked out well and the wood was really nice so it was worth doing, other wise it would have been firewood or bug food…….. neither of which is bad. 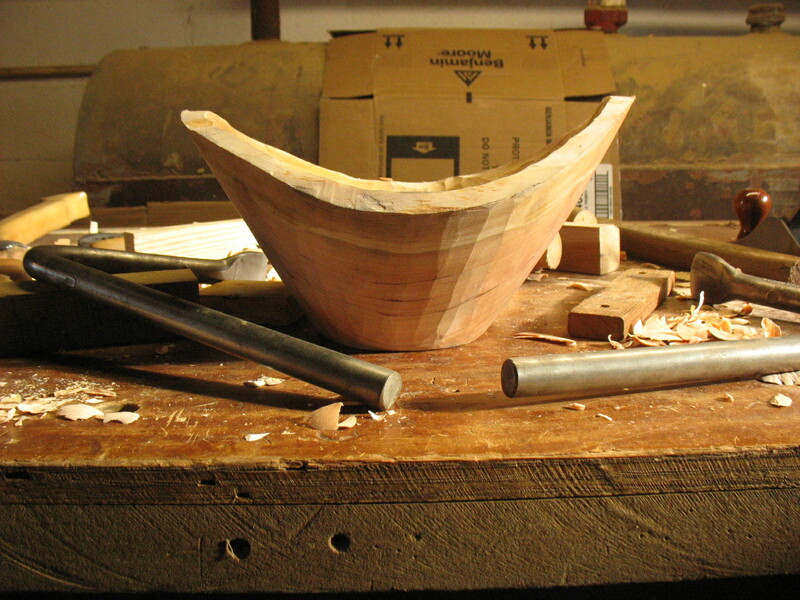 Then I had some time to work on a poplar log another friend told me about over a month ago,while heading over there he told me of a white oak nearby so I was able to mill that, still need to get to that poplar. 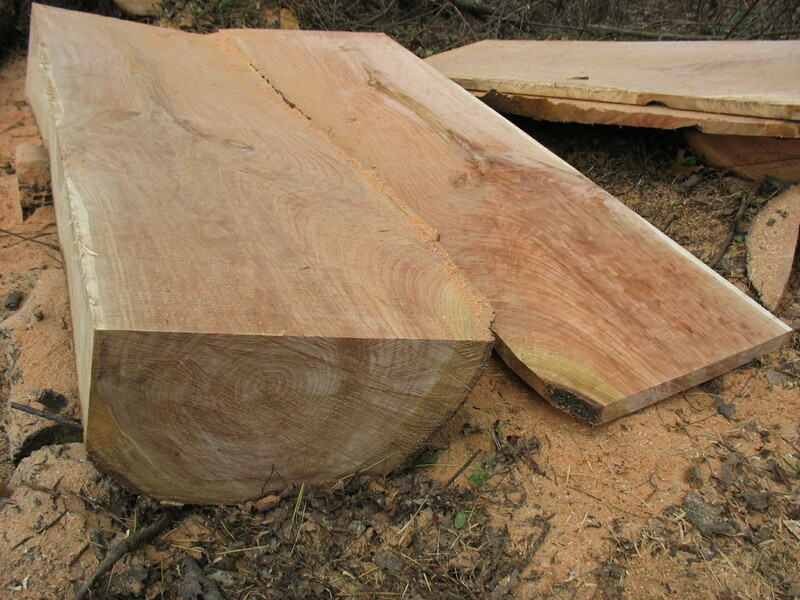 The cherry is about 21″ wide and the oak 18″ that’s a large slab or at least wider than what I m use to seeing at the local mills, drying might be tough with out a lot of twist and cracking but we’ll see. I sealed the ends and stickerd the pile and put weight on the stack. 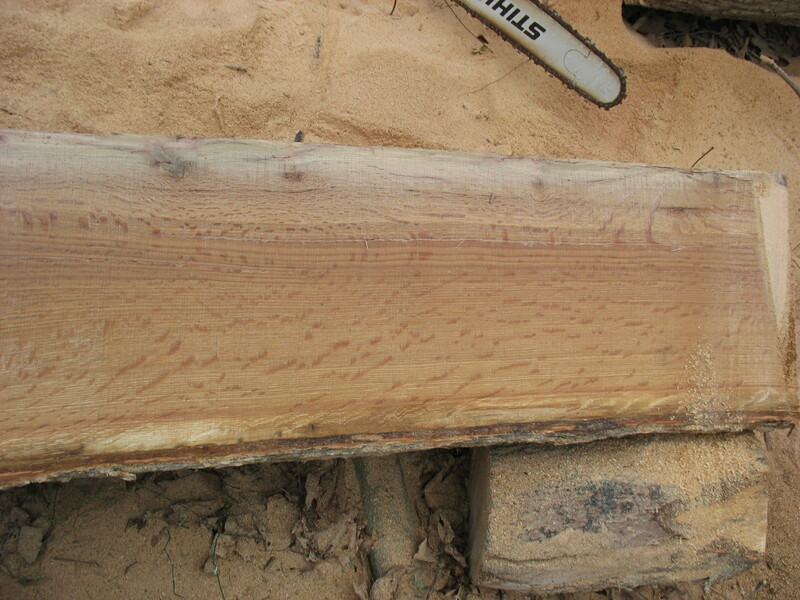 If you click on the pic and blow it up you’ll see a separation in the growth rings on the end grain, you can really see it on the sawn board, it’s a wind shake, the tree was blown around so violently by the wind that it cracked along the growth ring plane, not sure when I guess a pretty long time ago, the but was 29″ across so it had been there a while. BGE, the local power utility company dropped it. 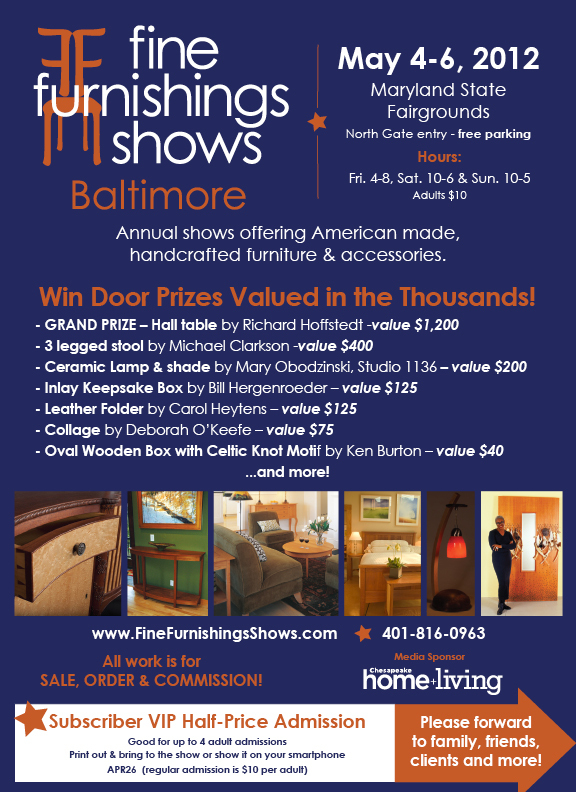 Don’t get me wrong I’m still riving oak, I signed up for the Fine Furnishings show Baltimore this year in May. I need legs for stools and parts for a settee that will be at the show. And just finished this Cherry bowl.